A Lifeboat Station was established by the RNLI at Bembridge in 1867 after local fishermen in an open boat went to the aid of the Norwegian Barque 'Egbert'. The first boat was 32ft long and had 10 oars, it was housed in a boathouse built at Lane End - the lifeboat had to be transported across the shore to launch it when necessary. 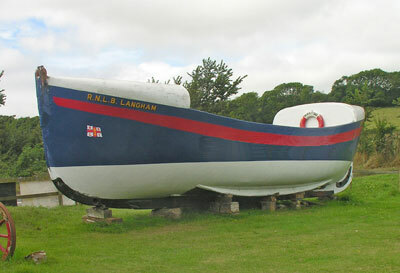 A new 34 ft lifeboat, the Queen Victoria, was went into service in 1888 (this boat was restored in the 1990's and is now housed at the Maritime Museum at Arreton). In 1922, a lifeboat pier was built with a boathouse at the seaward end; this housed a new motor vessel, 'Langham' which could be launched down a ramp straight into the sea. 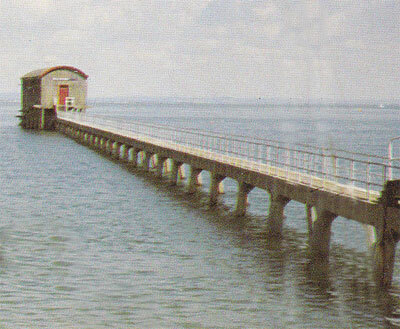 The pier was constructed of concrete and could be used at all states of the tide; this led to the closure of the Ryde station. The 'Langham' remained in service until 1939 when it was replaced by the 'Jesse Lumb'. In 1964, the old boathouse was brought back into use to house a new inshore lifeboat. In 1970, the 'Jack Shayler and the Lees' was placed on station and remained until the 'Max Aitken III' arrived in 1987. In September 2010, the Tamar Class lifeboat 'Alfred Albert Williams' was placed at Bembridge, necessitating another rebuilding of the pier and boathouse.